Video: Who will inherit heiress’s $500M estate? Closed captioning of: Who will inherit heiress’s $500M estate? >>> one of the richest and exclusive heiresses has died. she passed away on tuesday. prosecutors were looking into how her vast fortune was being handled. nbc's jeff rossen has the latest. hey, jeff. good morning. >> reporter: hi, ann. good morning to you. just to give you an idea how much money we're talking, she owns the largest apartment on all of manlt's fifth avenue. inside this building behind me, 42 rooms worth about $100 million. that's just the beginning of it. she herself is worth about half a billion dollars by some estimates. when she died this week, big questions started. what will happen to all of her money, especially considering her closest advisers are under investigation for stealing millions from her. she pass added away this weekend at a new york city hospital living under an alias. reclusive until her final breath. she leaves behind three massive estates. this one in santa barbara hugs the california coast. its value, over $100 million. clark 's estate in connecticut is worth over $20 million. and, of course, the prestigious fifth avenue property filled with dolls and fine art worth over $100 million. clark hadn't seen any of them in 20 years. instead she was living in seclusion in what would be her final home, the medical center surrounded by her french doll collection. clark 's lifestyle is so mysterious, this is the last known picture ever taken of her in 1930 . her death two weeks shy of her 105th birthday means the battle begins for her riches. >> she was buried wednesday evening the way she had lived, alone, no ceremony, no funeral mass , no priest. it was a strange life that came to a strange ending. >> reporter: new york prosecutors have launched a criminal investigation into her inner circle . her lawyer wally and her accountant irving. >> the gfters want to know if she was taken advantage of all those years. they have a roomful of documents to go through. >> reporter: wally quietly arranged his sell, a stradivarius violin for $6 million and a rpainting. >> as we say, follow the money. it goes some place. the court may freeze the money, put it someplace, lock it up, and have someone other than these two people in control of it until they can sort out the facts. >> reporter: clark who divorced young and had no children inherited her wealth from her wealthy father, a copper king . she reportedly has a will, too, but it remains unclear who's in it. the mystery stretches beyond the grave. we reeved out to both her attorney and the accountant. the accountant never called us back yesterday, but we did hear back from a spokesman for the attorney wally . he told us, cloak, madame clark 's passing is a sad event for everyone who love and respected her over the years. she died as she wanted with dignity and prove sichl we intend to continue to respect her wishes for privacy. it's important to note, ann, they would not comment on the ongoing criminal investigation against them, and we should mention this apartment is so big behind me if it does end up going on the market depending on what's in her will, it would make a huge splash here in the always business new york real estate market . >> jeff rossen , thanks. 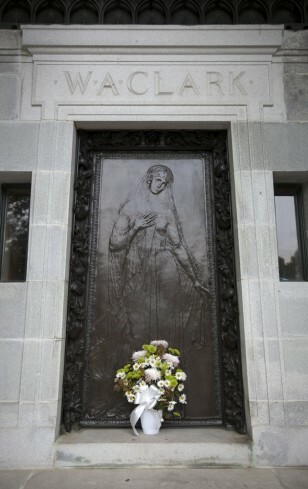 Flowers at the bronze door of the Clark mausoleum, where Huguette Clark was entombed on Thursday.